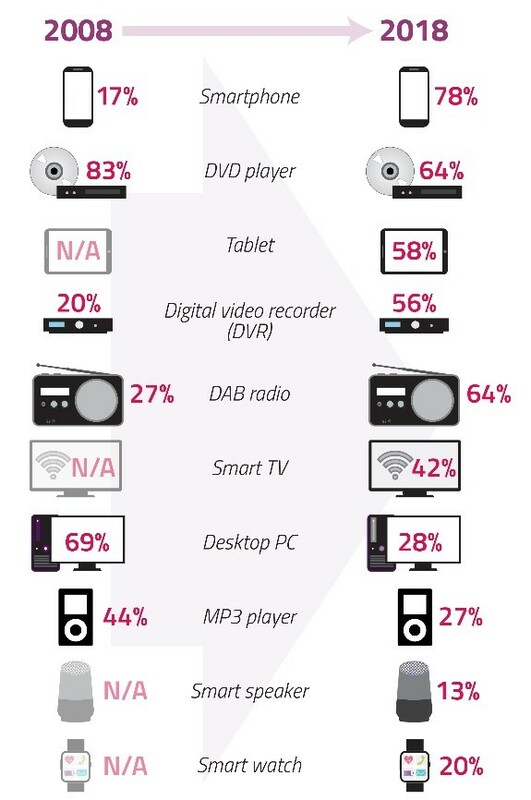 Most people in the UK are dependent on their digital devices and need a constant connection to the internet, according to research published today by Ofcom. Ofcom’s Communications Market Report is our most comprehensive study of how communications services in the UK are changing. This year it focuses on how technology has revolutionised our lives over the past ten years. 2008 was the year the smartphone took off in the UK. With the iPhone and Android fresh into the UK market, 17% of people owned a smartphone a decade ago. That has now reached 78%, and 95% among 16-24 year-olds. The smartphone is now the device people say they would miss the most, dominating many people’s lives in both positive and negative ways. People in the UK now check their smartphones, on average, every 12 minutes of the waking day. 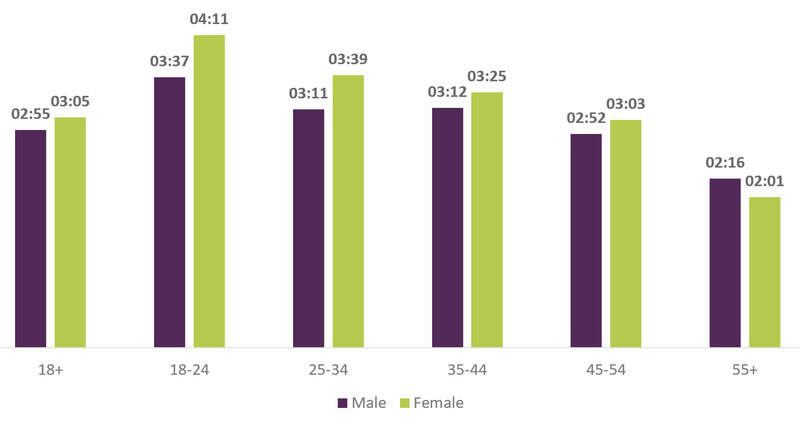 Two in five adults (40%) first look at their phone within five minutes of waking up, climbing to 65% of those aged under 35. Similarly, 37% of adults check their phones five minutes before lights out, again rising to 60% of under-35s. In contrast to a decade ago, most people now say they need and expect a constant internet connection, wherever they go. Two-thirds of adults (64%) say the internet is an essential part of their life. One in five adults (19%) say they spend more than 40 hours a week online, an increase from 5% just over ten years ago. For the first time this year, women spend more time online than men. 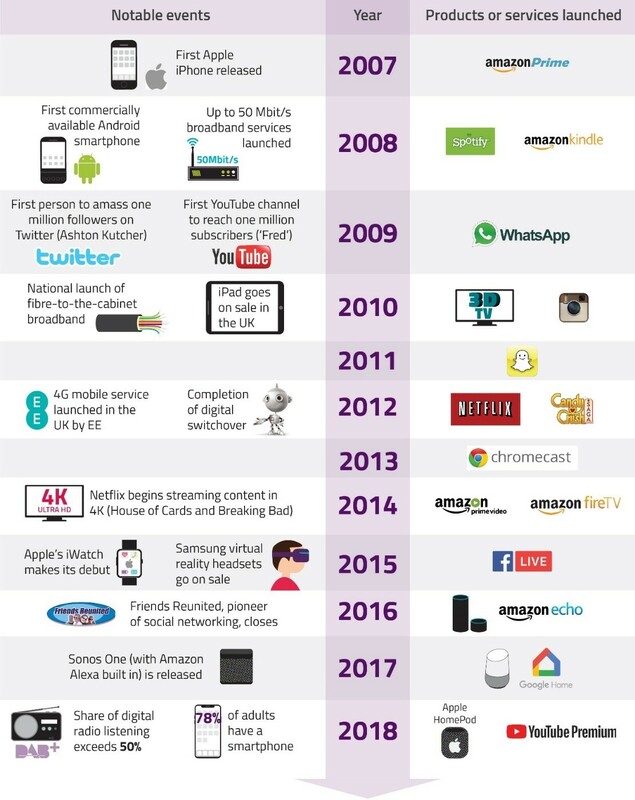 Over the last decade, better access to the internet has transformed how we interact with each other. Two-fifths of people (41%) say being online enables them to work more flexibly, and three-quarters (74%) say it keeps them close to friends and family. The amount of time we spend making phone calls from our mobiles has fallen for the first time, as we increasingly use internet-based services such as WhatsApp and Facebook Messenger. Using a mobile for phone calls is only considered important by 75% of smartphone users, compared to 92% who consider web browsing to be important. However, for many people, being online has negative effects. Fifteen per cent of people say it makes them feel they are always at work, and more than half (54%) admit that connected devices interrupt face-to-face conversations with friends and family. More than two in five (43%) also admit to spending too much time online. How do you feel without the internet? Around a third of people say they feel either cut off (34%) or lost (29%) without the internet, if they can’t get online, and 17% say they find it stressful. Half of all adults (50%) say their life would be boring if they could not access the internet. On the other hand, some see a lack of internet access in a positive light. One in ten feel more productive offline, rising to 15% for 18- to 34-year-olds; and 16% say they feel less distracted. The proportion of people accessing the internet on their mobile has increased from 20% almost a decade ago, to 72% in 2018. The average amount of time spent online on a smartphone is 2 hours 28 minutes a day. This rises to 3 hours 14 minutes among 18-24s. Seventy-two per cent of adults say their smartphone is their most important device for accessing the internet, 71% say they never turn off their phone, and 78% say they could not live without it. Ian Macrae, Ofcom’s Director of Market Intelligence, said: “Over the last decade, people’s lives have been transformed by the rise of the smartphone, together with better access to the internet and new services. Older and younger generations disagree on what they see as acceptable smartphone use around others, although many people admit that the way they behave in public on their smartphones is unacceptable in principle. Three-quarters of people (76%) find it annoying when someone is listening to music, watching videos or playing games loudly on public transport; while 81% object to people using their phone during meal times. The majority (53%) of adults say they are usually on their phone while watching TV with others. Six in ten people (62%) over 55 think this is unacceptable, but this drops to just two in ten (21%) among those aged 18-34. Many commuters now find it essential to be online during their journey, so they can complete tasks in their personal (42%) or professional life (35%). Young adults are more likely to multi-task on their commute: 9% of 18-34s carry out eleven or more online activities, compared to just 1% of over-35s.